House in Pouille, Nr. L'Hermenault, Vendee, Pays de la Loire, France - Rural Village, Superb Location for Attractions; Tabac, Boulangerie, Tourist info 5 Mins Walk! 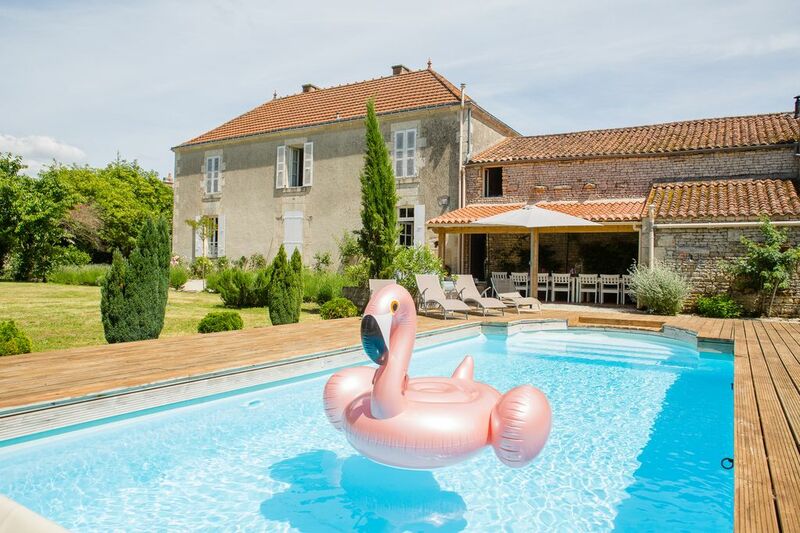 Situated in a quiet, friendly village in the Southern Vendee, 30 mins by car to the superb Atlantic beaches, 45 mins to La Rochelle and Ille de Re. The house is beautiful, set in 1.5 acres of its own private grounds within a village; it boasts large, airy, light rooms, is full of character and style and has a wonderful welcoming, easy feel. This house has many repeat bookings and guests rave about their holiday, you immediately feel at home. It's stylish, yet comfortable, you can see the strong attention to detail and is furnished to a very high standard. Please do take the time to read the guests comments! There are six bedroom, three of which are en-suite. We have 5 bath/ shower rooms in total. There are two seperate staircases with two wings of sleeping accomodation. The main house, a traditional Bourgoise French Farm house, has typically very large airy rooms and large french windows. Two of these rooms have modern, king four poster beds. The third bedroom is complete with two 4ft Antique doubles. So this room can sleep up to 4 sharing. The Grange, or Barn wing of the property also has three bedrooms, all ensuite. A master with super-king 6 ft bed or two 3ft twins if prefered, is very cottage and classic in style and has an ajoining bathroom with a footed stand alone antique bath. A futher pretty double, stone walls, bespoke bed and a bathroom with shower ensuite. The third bedroom has 3, 3ft single beds and is a pretty room with a lovely shower room ensuite. Perfect accomodation to enjoy this charming house and its facilities. The downstairs hosts a large airy dinning room seatiing 16, which is lovely for more formal dinning, summer with the french window open, or Christmas and New year with the log fire burning. The Kitchen has a large square table, equiped with all the facilities you would hope to expect when cooking for up to 16. The house is well equipped for foodies, decent pans, sharp knives etc! There are two sitting rooms, one in the grange which is vast, with a double height celing and gallery. This is a wonderful relaxing room and is lovley and cool in summer, it easily accomodates all the guests. It has a large wood burner for chilli winter evenings! The second sitting/ reading room, is in the main house, and also doubles up as a movie and music room room. This room is furnished with chaise longues so reading and movie watching is a real treat! This room also enjoys high ceilings and is of generous proportions. There is a well equiped utility room, washing, drying, butlers sink. The downstiars toilet is easily accessed form the garden and pool. Relax by the heated pool, which is really heated to 26 degrees, while the children play table tennis or games in the kids den! Dine alfresco on the terrace, the outside dinning caters for up to 18. The stunning terrace is large and also has a covered cooking area. Explore the garden and enjoy the orchard, all fruit is organic and you are encouraged to help yourself to the fruit in season! Alternatively, if you can tear your self away from the house and grounds, enjoy the atmosphere of rural France on your doorstep! Great walks, cycles and runs through the sunflower fields from the door. Whilst many guests agree, it's hard to leave the house; it is a perfect rural base from which to explore the Vendee countryside and its many attractions. We are a family with School aged children living in London and escaping to Pouille! My husband works in Central London and I am a Photographer. We have owned our house in France since 2006 and have lovingly and steadily restored and developed our property. The French House is a fantastic lifestyle balance for our children, friends and family. Our French House is a second home and much more than a holiday let, and our guest book demonstrates our clients sincerely agree! We constantly make an improvements to the property and listen carefully to all our guests ideas and comments. So each year guests return there is likely to be something new and different! There were a few reasons for buying our house in this area: firstly and in no order That its just about as far south as you can get in one drive! It boasts the most hours of French sunshine outside of the Mediterranean coast. The weather is always much better south of the River Loire. A village situation gives us all a chance to integrate with our very welcoming and friendly neighbours. Last but not least the house was so beautiful that we couldn't not buy it! There are many benefits unique to this property, and small personal details make a difference. The house is furnished to a very high standard in every room, no compromise! A big benefit is that the pool is actually properly heated, often holiday rentals compromise on this! The fact that you need not leave the house to have a great time, 1.5 acres, swimming, chilling, beautiful garden, games and relaxing. The wonderful orchard with help yourself fruit trees - apricots, apples, pears, figs, nuts, herbs and fresh flowers. Finding the occasional food parcels brought by neighbours and left on the door step in the summer! The property is well equipped to accommodate children. Quality linen, decent white towels and comfortable beds. Heated pool 26 degrees. Open fires, wood burning stove. Tabac, and Patisserie in the village. Good communication links. Many beaches, forests, culture, activities. Gardener, Pool service, house keeper. Additional cleaning service. I am at the end of the phone line to help you with any questions shodl the need arrive! toilet, Downstairs toilet, next to shower room. toilet, combination tub/shower, Ensuite to bedroom 6. Antique freeestanding bath. 1st floor: bathroom with bath/shower, wc, bidet and wash basin. Ground floor: Stylish room with modern corner shower unit, bidet, wash basin, heated towel rail and adjoining toilet. Two en-suites, one shower room and one bathroom. Friendly and authentic french Vendean village, with tabac good bread and tourist info. Spacious lounge, original parquet floor, stone fire places, art work, 2 large sofas, both modern and antique French. Door to the garden. Home cinema and music system that supports mp3 players. Large dining room, with a white, wooden table which seats 16. FABULOUS WHISTERIA COVERED SUNNY TERRACOTTA TERRACE AND COVERED COOKING AREA AND WITH OUTDOOR SEATING AND DINNING. ADDITIONAL DECKED TERRACE AND OUTDOOR SOFAS. POOL SUN LOUNGERS. Notes on accommodation: The house and gardens are ideal for children and families, couples wanting a romantic get away and some peace and quiet, but large enough for groups and small events. There are many areas to the house and garden you can tuck yourself away! We have lots of space 1.5 acres in total. Heated Pool and decking. Gated garden , orchard and field. There is a kids play den, table tennis, boules, toys and games equipment for playing outdoors. For babies we have a travel cot, high chair and stair gates. The proportions of the house are very large and spacious with most of the rooms around 5m square. We often have friends staying with us and 3 families are easily accommodated. We have a home cinema and games console. It is rarely necessary to heat the house but there are effective, instant, easy to use mains electric heaters in all rooms. There are electric towel rails in the ensuites. There are 2 Wood burning stoves making cosy and atmospheric Christmas and Autumn rentals and large fire places in the lounge and dining rooms. Outside: The house and gardens are ideal for children, families, and for guests wanting a rural get away treat! There are many different areas in the garden, where you can find seclusion for reading a book in peace! The wonderful terrace covered in wysteria and Jasmine provides a great area for socialising and entertaining, there is a large covered built in BBQ cooking area. The sun deck around the pool is a great place to relax on a sun lounger or the large outdoor sofa and lounge area. The pool: measures 9.5m/4m, 1.5m deep. The pool is heated and has lighting. It is fully serviced. The pool complies with french safety standards and has a discreet safety cover which is easy to operate. We also have a turtle alarm system.The child is alarmed rather than the pool, by wearing a turtle wrist band. Full instructions are provided prior to arrival. Utility Room: Utility room includes, utility sink, washing machine, dryer, airer and iron and ironing board. Microwave. It is adjacent to ground floor shower room. There is storage space for food and provisions. Cleaning / Towels / Linen / Maid service: Quality white bedlinen and towels are included! Pool towels not supplied. The property is cleaned weekly. Additional cleaning can be provided at an additional cost. Other: There is a rose and wisteria sunny terrace, a covered built-in barbecue and a table that seats 12. The grange (barn) is part of the house and is a huge entertaining and relaxing space. There are two swings and a small Zip wire. Wonderful, relaxing holiday for a 3 generation family in a tranquil village setting. This beautiful, spacious house is stylish, comfortable and really well-equipped. We loved the fantastic outdoor eating area, amazing pool and gardens and day trips to nearby La Rochelle and Ile de Ré. Thank you so much - we are delighted you had a lovely time, hope to see you again soon. Sandi was helpful and always responded to queries quickly. The area is fairly remote but the heated pool and the great gardens meant that we spent loads of time at the house. Hours were spent playing pétanque as the kids had fun swimming. We had a amazing family holiday. We are so glad you had an amazing holiday! We really appreciate you taking the time to write about your stay with us at No 34. We do hope to see you friends or family here again soon. Well equipped, stylish property. If you like cooking then the kitchen is really well equipped. The garden is spacious and well tended. A real home from home, only with better interior decor! Thank you for you review, we really appreciate it! We fope to see you again soon at NO 34! A truly marvelous place! We were 12 in all (3 families) and everyone had the space to be both together and apart. The kids (from 9 to 16) played constantly and never once asked for electronics! I put it down to the table tennis table and the zip wire in the garden!! And of course the pool. The kitchen is very well equipped and there is enough stuff for everyone and everything! And the decor is just fab, just a lovely place to stay and share great times. Thank you Sandi! We really appreciate you sharing your holiday experience. We look forward to seeing you again at no34! We've just returned from a wonderful stay at no34. The house is massive, beautifully laid out with great open spaces to cook and relax. We were blessed with a lovely hot week, so spent the majority of our week poolside and in the garden. The area is pretty remote, but the giant Leclerc in Fontenay is just a few miles down the road for all supplies you might need. Many thanks to Sandi, who was always accessible and super friendly, we'll definitely be back!! We look forward to having you to saty again soon! 40 mins drive to 120 km of atlantic beaches. 1 hour to the centre of Ille De Re. 45 mins to Pui de Fou - one of the largest tourist attractions in France. Vouvant, Mervent forest and lake and Fontenay le Comte 20 mins. If you are travelling by car, all the ports are easily drivable. Caen and Cherbourg are 4 to 4.5 hours respectively. The nearest port, St Malo, can be reached in approximately 2.5 hours. With a longer drive, the channel tunnel can be reached in 6 hours. If you are travelling by air, La Rochelle is the nearest airport and is approximately 40km away. The airports of Nantes and Poitiers are a little further. TGV is now an excellent option to Niort. L'Hermenault: 5km. Nantes: 100km. Bordeau 2 hours. There is a local boulangerie and tourist information. The next village, L'Hermenault, village bakery, butcher, mini market, tobacconist, post office, banks, pharmacy and doctor. Fontenay le Comte 12k offers many cafe/bar/restaurants, hospital, vet and various supermarkets and a popular open air market on Saturday. Booking Notes: CHRISTMAS AND EASTER DATES ARE FLEXIBLE PLEASE ENQUIRE! Please do, if you prefer, contact the owner directly to confirm your booking. APPROX.Deposit of 30% to be paid at time of booking. Payable by cheque or bacs. or via the O/Direct site. Balance paid 60 days before arrival. The house is partially heated by wood burning stoves off season. Absolutely necessary at Christmas and New year, there is an additional charge for the wood - but the wood is limitless! Pool: we usually open the pool in May. We can arrange to have the pool ready for Easter, this incurs an additional charge of £100 per week. We will try, but because of air temperature cannot guarantee the 26 degree temperature! Breakage deposit required. Changeover Day: Generally Saturdays. Arrival 4pm strictly not before to give us the best oportunity to prepare your property. Departure 9.30am. Prompt. Weekend rates available for MAY SEPTEMBER AND OCTOBER Notes on prices: Please call with any questions, we look forward helping you with your holiday!